More reporters – "feet on the street"
In the years since, SRG members and others have made remarkable progress in realizing this vision. We all know many of the markers – the tremendous recent audience response to public radio's news stations; the two dozen or more ongoing state, regional, and topically-focused journalism collaboratives; the growing commitment to journalism among some public television stations; and numerous inspired and passionate projects that have taken station reporters and producers out into the community for sustained coverage and rewarding partnerships. Over the past few months SRG has returned to those transformative goals. How are we doing? 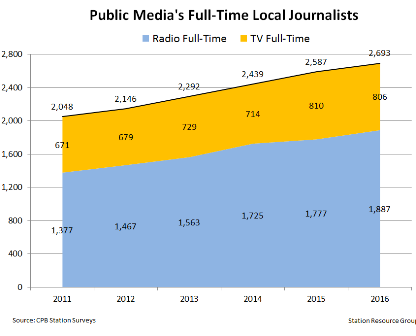 Public radio stations added at least 510 full-time journalists and, adding in part-time and contract journalists, a total of 668 journalism positions. Over the same period, public television stations added another 135 local journalists and 156 positions overall. We are eagerly awaiting the data on station personnel from FY 2017. Meanwhile, here is the five-year trajectory of full-time local journalists. In addition to this collective accomplishment, there is a growing number of stations achieving break-through heft in their local newsrooms – 37 organizations with 20 or more full-time journalists, of which 22 are SRG members. It is time to begin resetting the bar and raise our sights once again. There are multiple possible venues for this conversation and we are ready to move on one of them – a third iteration of the Opportunities in Public Media Journalism meetings. As a reminder of where we have been, in 2016 and 2017, the Wyncote Foundation, Public Media Futures Forums, and SRG partnered to bring together top executives from several leading news stations, national networks, and funders that support public media journalism to explore ways to strengthen public media journalism. In 2016, we focused on creating a greater sense of partnership, both local/local and local/national. In 2017, the emphasis was on smarter use of digital and social media tools in creating and presenting our journalism. An important outcome of the 2016 meeting was a collaborative project on investigative reporting funded by a grant from CPB to APM and several station partners, and, somewhat more indirectly, a collaborative weeknight national call-in show, Indivisible, that aired during the first 100 days of the Trump Administration. The program was produced by WNYC, MPR News, and The Economist and carried on many public radio stations nationwide. A key outcome of the 2017 meeting was an analytics working group that has pursued a focused set of Key Performance Indicators for news stations' digital audiences. Mark Fuerst, Public Media Futures, and Steve Mulder, NPR, took major responsibility for shepherding this work, which they recently reported in an article for Current. A team of station digital leads worked for several months on the project. Another 2017 outcome was the emergence of discussions around strengthening public media's "culture of journalism," prompted by an exchange among PRX's John Barth, NPR's Mike Oreskes, and others and now being pursued by NPR with station content leaders. For 2018, the SRG Board endorsed an approach centered on articulating the "next level" of significance and impact for public media's leading local and regional news organizations– those stations that are ready to move to a front-line role in their communities' news environment. To keep the conversation focused, engaging, and inclusive, we also proposed holding more than one meeting and again including a combination of station executives and funders. The Wyncote Foundation is on-board with this approach and will again participate as a sponsor and planner. Mark Fuerst, whose work is supported by Wyncote, will work with SRG in planning the meetings. We outlined the plan to Kathy Merritt, CPB's Senior Vice President for Journalism and Radio and she is also committed to participating. Our first meeting will bring together a half dozen West Coast public media stations with a significant commitment to journalism, including a couple that are not SRG members. We are inviting CEOs plus content leads from the stations. We are also inviting NPR to participate. SCPR will host the meeting in Los Angeles June 14-15. We are recruiting a few additional funders with guidance from Wyncote and the participating stations. We will bring results of the Los Angeles meeting into our August retreat. We are planning at least one and maybe more meetings in the fall, organized along similar lines elsewhere in the country. Public media journalism has a very powerful story of local growth and investment emerging here – one that deserves a wider telling and appreciation. We are ready to start writing the next chapter! Postscript. As we were pulling together material for this update, we came across a St. Louis Public Radio video prepared for their annual "Talk Toast Taste" dinner, which this year turned out 400 friends and supporters. It will make you smile. We would welcome other examples of SRG members telling the story of their journalism and connections to community. Copyright 2018 Station Resource Group. All Rights Reserved.